The despacho is a gift for the organizing principles of the Universe and constitutes the central axis of energetic exchange for healing, reestablishing perfect ayni (right relationship), or protection. The despacho is the living embodiment of the shaman’s landscape of life, that which meets at the level of the soul and ultimately connects to the source of all creation. The despacho ceremony, in its physical beauty, is a journey to the soul of nature, and with the assistance of the spirit world, we explore the energetic inner workings and symbolism of each element of our offerings. 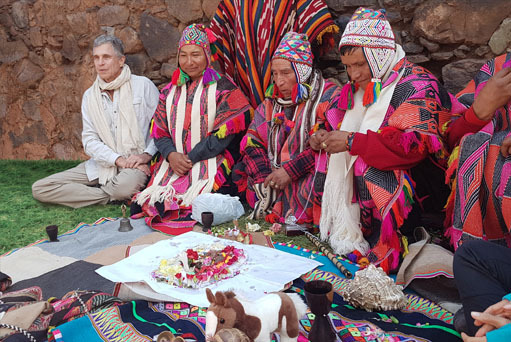 Traditionally, in the Andes, a despacho ceremony is performed (individually or communally) after each earth cycle to renew and re-imprint the powers of nature on our luminous body, to connect with the Universe and accomplish perfect ayni – not for us personally, but for the wellbeing of our “Ayllu” or group. A despacho brings the shaman into harmonious relationship with Heaven and Earth, aligning the three worlds of the Uhupacha, Kaypacha, Hanqpacha and the archetypical organizing principles of the Universe. Each item of offering represents a prayer and a gift of power that sparks the momentum for energy shifts and healing. Begin with a large piece of white or colored paper. This will be the “wrapping” for your offering – think of it as a present. Flip chart paper or non-foil wrapping paper works well. Fold the paper into thirds one way and then thirds the other way so you have nine squares. Working within the center square, you begin to layer the burnable objects that have been informed with your breath, so the energetic essence of your prayers is within each one. Large piece of white paper: Envelope of dreams in which we “write” our prayers. Blow your intent for reciprocity and balance in to this empty, folded gift. Sugar: Represents sweetness and love. Qintu: In Peru, they typically use three coca leaves, but you can utilize three small leaves from trees native to your area. We often use bay leaves, so look for leaves about that size. Red and White Carnations: Red for the Earth and white for the mountains. Place a red and a white carnation petal on top of the Qintu (to represent the snow-covered mountains reaching the Heavens) on top of the red petal representing the Earth. Build the foundation of the despacho with the Quintus, informing each with your prayer (use a minimum of 12 Qintus). Cover the Qintus with a little more sugar, representing even more love and sweetness. Place one open shell in the middle of the prayers, representing the womb of the Earth, our source and birthplace. This holds us, nourishes us, and provides opportunity and safety. Rice: Fertility and abundance, to bring your prayers into fruition. Nuts: Gifts for the Plant People. Beans: For protection, abundance, power places, and the springs that nourish us. Corn: Sustenance, gift back to the Earth for what we have been given. Raisins: Spirits of our ancestors, our blood lineage. Figs: Spirits of the ancient ones who dwell in the sacred mountains. Alphabet noodles: To step outside and beyond language. Animal crackers for animal spirits, and health. Candies, candy hearts, sweet gum drops, candy corn, etc. : Represent everything we are in relationship with. Loose sage or other incense: To feed the elements of the Earth. Gummy or candy frogs: Represent messengers, envoys to carry our prayers; and cycle of waters. “Play” money (one piece): To ensure successfulness of the despacho. Unraveled cotton balls (clouds): Represent aware-time and dream-time. Confetti stars: Represent connection to the stars. Colored confetti or sprinkles: To celebrate all life. Rainbow yarn: Represents the bridge between the worlds. Red and white cord: Represents the “red” road and the Hatoon Yan, or road to the stars. When you have placed all your items in the despacho, the corners of the large paper are then folded over the contents so that they all overlap at the center to form a smaller square. Tie the despacho without flipping it over so that all the prayers are sustained. The despacho can be either buried (for slow, steady results), burned (for quicker transformation), or fed to the running waters ceremonially within a reasonable amount of time after it is prepared. When the despacho is placed into the fire, participants generally do not look towards the flames until after the offering has been burnt. This symbolizes non-attachment to the outcome and release of all claim to that which has been given away.